91% of Americans want tougher background checks for gun purchases. Clearly, 91% is a huge, bi-partisan majority. We don't usually agree to that extent on ANYTHING. And while I laugh at her name (Crystal Ball), I agree with this MSNBC newscaster who said that with a majority this huge supporting enhanced background checks, if Congress can't get anything done on this then we aren't living in a democracy. She's right! 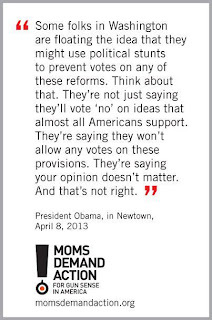 We elect these people to reflect what we want--which are stronger background checks. Yet Congress gets paid off by the gun industry and emboldened by this, ignore the 91% of us who don't want to be gunned down by loonies like Adam Lanza. So we trot out the Sandy Hook victims' families to beg that we don't forget as GOP congress members prepare to filibuster gun reform. 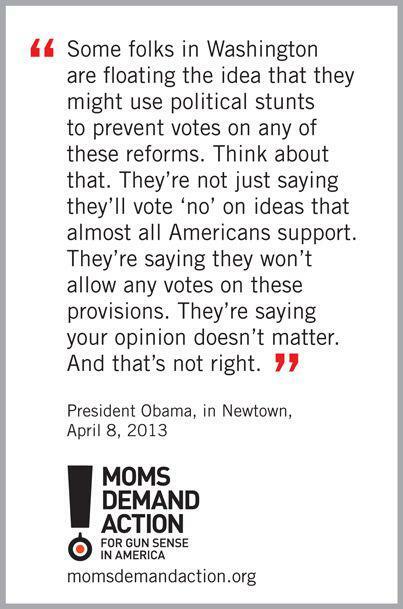 Who are these 9% who don't want enhanced background checks on gun sales? Violent criminals? The mentally ill? Terrorists? I'm so glad the GOP is hell-bent on protecting these groups rights against the massive majority who wants to know who is accessing assault rifles with large clips. The background checks were supposed to be the easy part. Our government is broken if they can't get what we want done.